If you’re trying to shop on a budget as one of your New Year’s resolutions, you’ll love today’s post! 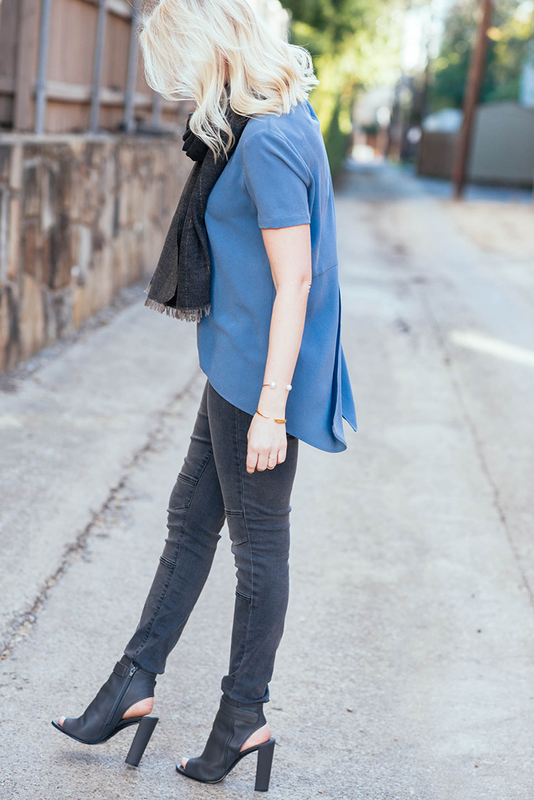 I recently picked up this BCBG blouse on sale for only $85 at The Domain location in Austin, but because the temps have been so chilly I haven’t had the chance to wear it! That is until last weekend, when the weather lightened up considerably in Dallas. It was so nice not having to lug around a heavy coat or wear a bulky sweater around all day. 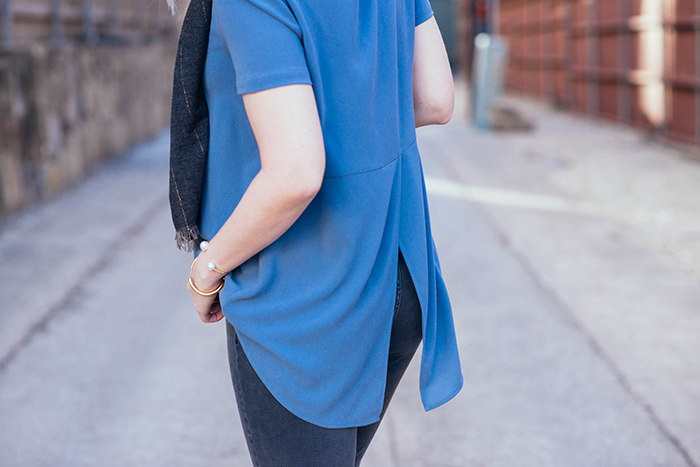 I hope to pick up a few more breezy tops like this one for spring – the solid t-shirt style with a fun slit-back detail make it ideal for pairing with jeans, shorts and more for a casual but refined daytime look. 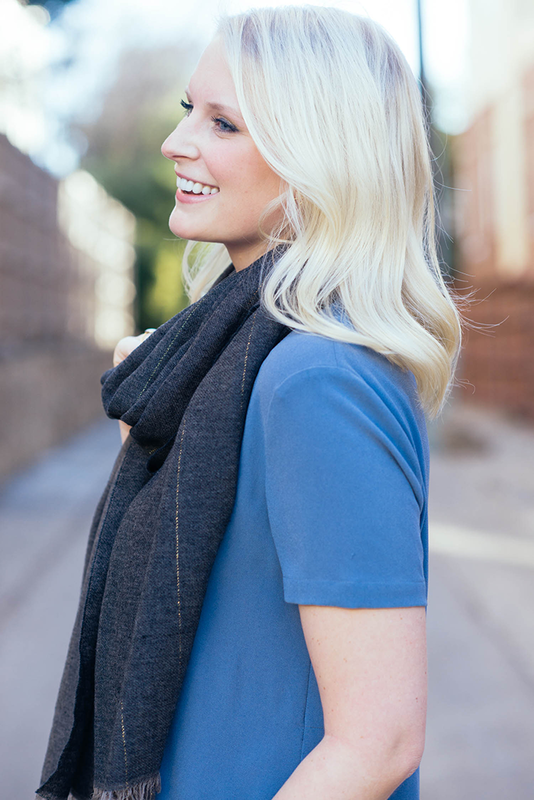 It’s an easy piece that transitions seamlessly from day to night as well. The best part? This blouse has now been marked down to a crazy low price of $63. Another great deal from today’s look is this pair of Old Navy jeans – they’re marked down to only $28! There aren’t a whole lot of sizes left, so get some quick! If your size isn’t available, here are a few more pairs of grey denim to love: this light pair by Citizens of Humanity will be a great alternative to white jeans this spring/summer, this Rag & Bone pair is on sale, and these Topshop moto jeans are only $80! PS – my Vince booties are on sale too! I love this! It is very simple, yet very elegant look! Love these booties so much, and the color combo is beautiful. Stopppp. You know these are my two favorite colors! SO CUTE. So pretty – this color looks amazing on you and I love your eye makeup here! You look absolutely amazing! And so tiny! Love that top! You are so gorgeous! Blue is definitely your color. I love your hair curled too. Love the colors and your hair looks AMAZING in this one! Love the way you styled your new ‘do! Stunning looks! Love how well this shade of blue mixes with the greys. Love the blouse!! Your hair & makeup look amazing as well! Gorgeous photos! Love these colors together. absolutely love the chic simplicity of this look! That blouse is a great find. Omg! Love the hair! You look stunning! 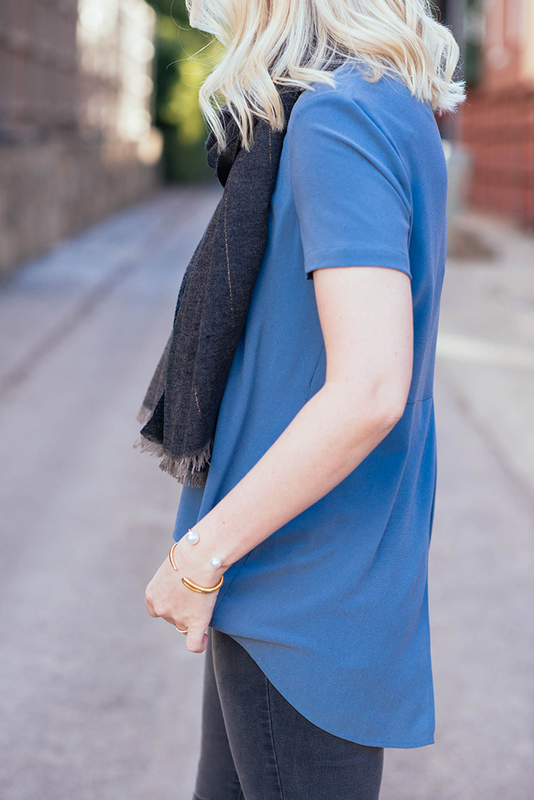 Loving this blue and gray combo. Very winter chic! And that scarf and your booties are the perfect additions! Love this color combo! Hope you have a great weekend! Love that beautiful close up shot of you smiling. Beautiful! That shade of blue is gorgeous! I love that scarf and those shoes too! LOVE the shoes and your bracelets, Merritt!! This is so pretty! 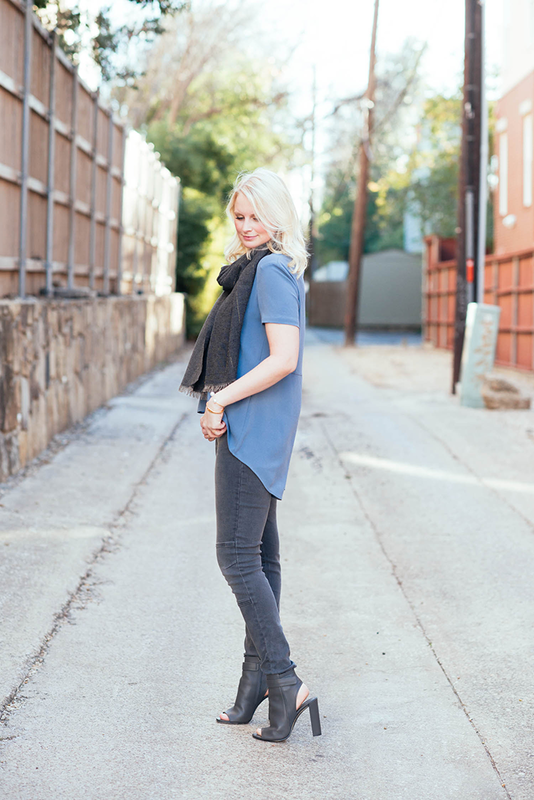 Love the top with the scarf, the jeans, shoes…everything! Hope you’re having a great time in LA. You always look amazing, but you look especially beautiful in these photos! Just gorgeous, Merritt! Those peep toe booties! I wanted them….badly, but ended up getting something similar by Dolce Vita instead. So chic and so affordable! Thanks for the share, and love that color on you!